Zynga’s FarmVille proved to be a runaway hit when it launched back in the heady days of 2009, and three years later millions of faux-farmers still habitually tend to their digital crops every day. Slowly but surely though, the number of users coming back to get their fill of farm life has begun to decline. Sure, the company has bolted on new features and locales over the years, but even after all that FarmVille’s core remained largely the same. Even so, FarmVille still treats its creators very well (Zynga’s most recent 10-Q filing pegs FarmVille as Zynga’s top revenue-generating game yet again), and the company clearly isn’t done trying to keep the property fresh in people’s minds. That Zynga would look to craft a sequel was only a matter of course, and now the company has finally unleashed that follow-up — FarmVille 2 — to the masses. There’s actually a story here of sorts for one, though gripping epic it ain’t. Upon firing up the game, new players are greeted with a postcard from a childhood friend imploring them to return to the family farm and restore it to its former glory. It shouldn’t come as a surprise to hear that the only way to accomplish that feat is to plant crops, till fields, and breed animals until your fingers get sore. Just beyond that (flimsy) narrative frame is a considerable graphical update, which Zynga’s Wright Bagwell told me was meant to breathe some life into an otherwise static-looking world. The game’s development team (which remains separate from the folks who continue to work on the original FarmVille) leaned heavily on Adobe’s Flash 11 and its Stage 3D APIs to overhaul FarmVille’s looks. 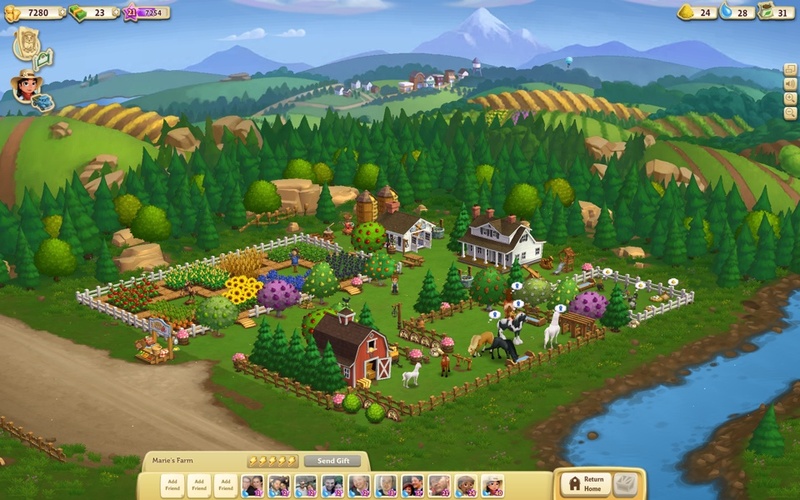 The changes are immediately apparent to anyone who’s seen the original — a player’s farm exists in a more fully fleshed-out environment with hills and a town visible in the distance (Zynga is tinkering with the idea of making it a social hub down the line), a far cry from the underwhelming expanse of green that bounded farms in the original. The world, along with inhabitants like animals, rendered in greater detail and are loaded up with animations to make the whole thing feel ever-so-slightly more real. As it turns out, FarmVille 2’s visuals were even more important to nail than I had expected. According to Zynga VP of Games Tim LeTourneau, the sequel’s goals extend beyond attracting new players — it’s also meant to reignite the latent desires of FarmVille players who have “moved on from the game.” Apparently, the window for getting players of any stripe to stick around can be a pretty small one. Of course, graphical changes alone do not a new game make. Perhaps one of the biggest changes to the game’s mechanics is crafting — players can harvest component materials and ingredients and combine them to create food and items that can be sold at their roadside stand. The game’s controls have also been streamlined a bit in an effort to reduce incessant clicking — users can now use a sweeping “painting” motion to water crops and plant seeds without having to wear out the ol’ index finger, as well right click (!) to rearrange the decor. For a highly-social game like FarmVille 2, Zynga wanted to put more emphasis on the importance of bringing a user’s friend into the mix. Enter the “Farm Helper” concept, in which friend a user can invite friends to help out on their farm and (more importantly) direct them to perform specific tasks that needed to be done anyway. These sorts of game mechanics aren’t the sort of thing to be included in a final release without some extensive testing, and Zynga has done exactly that. Kim-Mai reported earlier this year that a FarmVille lookalike called Big Harvest went live in the Philippines, and LeTourneau did confirm that the company performed real world testing on different FarmVille 2 features under that name. While we’re on the subject of FarmVille’s players, one of the most important things to note about FarmVille 2 is how Zynga plans to transition its userbase from the original to its successor. Simply put, it won’t. There’s a general tendency for sequels to steal much of its predecessor’s thunder, but LeTourneau made it clear that Zynga isn’t quite done milking the original just yet. The task of cobbling together a worthwhile follow-up is no mean feat, especially when the original has garnered such a tremendous amount of addiction/adoration from its userbase. After all, for every Empire Strikes Back-type success, there are many more Grease 2-esque flops littered at their feet. Despite what the number in the title may indicate though, FarmVille 2 doesn’t feel so much like a sequel as it does a refinement of the original formula — a director’s cut if you will. Only time will tell whether FarmVille 2 reaches the same sort of heights that its forebear did, but for now the FarmVille experience has gotten a much-needed shot in the arm and users are sure to take notice.